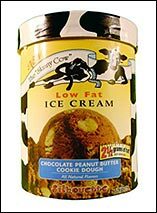 I know you said Skinny Cow ice cream cartons were going away, but I love them and am dying to know if there are any left ANYWHERE. Can you help? I have gotten a TON of mail about this ice cream. As we reported a few weeks ago, it's no longer in production. That being said, many people have written in about Skinny Cow sightings across the country. If you're not one of the lucky few who have found these scarce tubs of frozen goodness at your local market, you'll be happy to know that we have found them for sale online in MANY flavors! If you want vanilla, chocolate peanut butter cookie dough, cookies 'n cream, strawberry cheesecake or chocolate fudge, they're all here. But no one knows for how long. So snap 'em up while you can. 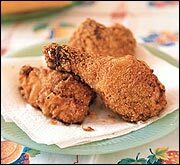 If you fry chicken, plain, without any breading, and then eat it (no skin), would you still be consuming a lot of fat and calories? Also, does the same go for other foods like fish? One last thing...if I pick the breading off fried chicken, is it a diet-friendly food? Eating chicken without breading or skin is a very good idea. Both skin and coatings add tons of fat and calories to your poultry (in fact, more than half of the fat found in chicken is in the skin). And, when it comes to skin, your best bet is to take the stuff off BEFORE cooking. While you can peel off the top layer of skin (and breading) once the chicken is already cooked, the fat that was under the skin will have melted, and some of it will have been absorbed into the meat -- which will make it juicier, but also more fat and calorie-packed. As for frying, even if you cook your chicken with no breading or skin, frying it in oil will add a significant number of calories (the same holds true for fish). Try to instead use non-stick cooking spray, chicken broth, flavored vinegars, etc... in your cooking. Believe it or not, I Iove cooking chicken on my George Foreman Grill. The easy-to-use grill cooks your chicken and drains all the excess fat into a little fat-trapper thingee. Go, George! Today, April 6th, is National Caramel Popcorn Day. Celebrate by mixing a handful of Cracker Jacks in with your regular Jolly Time Healthy Pop Kettle Corn Minis! SUPER DUPER SUGAR FREE MUFFIN SPECIAL! Don't miss out...get 20% off Vitalicious' Sugar Free sampler pack! (The banana nut are HG's absolute favorite muffins EVER!!!!) Remember to use promo code "SugarFree" for your discount.